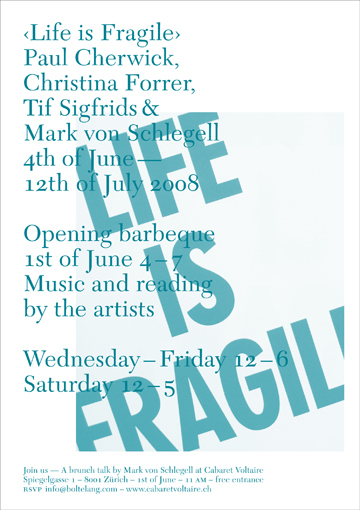 Life is Fragile is an exhibition of works by artists Christina Forrer, Paul Cherwick, Tif Sigfrids and Mark von Schlegell. As close friends and colleagues they are an artistic microcosm within the vast LA landscape and its art world. Presenting an objective view, the group’s work is complemented by a text by Mark von Schlegell, an American writer now based in Cologne. Swiss-born Christina Forrer (b. 1978) has lived in Los Angeles for more than 10 years. Her practice is informed by her interest in product design testing the boundaries of its form and function. Forrer uses found images selected for their peculiarity and combines them to create new entities that teeter between credibility and the unbelievable. Grouped together, these objects in a fragile state of being are not clearly either symbolic or decoration. For the exhibition at BolteLang, Forrer has realised her largest installation to date. Tif Sigfrids (b. 1982, Wisconsin) works with how the material of a place defines perception of its history, and with how domestic materials are perceived in a non-domestic space. By applying a specific décor, Sigfrids evokes a location in a period in recent American past; key is that this is not a construct installed for the duration of an exhibition, but something that remains to become part of a confused composite history of the environment. It assumes a ‘semi-permanence left in the hands of the future inhabitants of a space to reconcile with’. Her installation at BolteLang will transform the gallery’s office. Canadian Paul Cherwick (b. 1974) constructs an elusive identity as an artist. A highly skilled craftsman, he works in different scales, media and form so as to resist definition. His process begins with a fixation, which catalyses the form of a work, yet once the fixation or idea is made manifest, the materials direct its final outcome. For this show he has made ten works from fabricated elements combined with objects found in vacant lots surrounding his studio; although a group of individual works they form one allegorical whole. Mark von Schlegell’s short story The Artist Abstract takes a lofty view of the exhibition, but, like all the works, is a framework to be triggered by the associations of the audience. A narrative of creativity, epiphany and the artist in the city, it is published as an edition by BolteLang.Although Forrer, Cherwick and Sigfrids have discrete practises, each of their works present a fictitious universe composed and manipulated through the use of icons and objects. These assemblages are psychological dioramas of each artist or a landscape of their identity. The three artists have brought their own history to LA, a city that represents a promised land, a place of aspirations and dreams, of alterna- tive cultures and liberty; in different ways they collage and combine their histories with their current surroundings.